All photos by Abby Ryder-Huth. Tokyo holds its own as a fashion capital, as even a brief stay in the city makes clear. But with a dizzying array of side streets, must-sees and mega-malls, it can be hard to sift through and find those places where style runs free and untethered. We walked all over Tokyo, looking out for independent boutiques that were doing it right. Here are five that deserve a second visit. Junky Style is hard to miss on an otherwise utilitarian street just outside Ryogoku Station. Whether you’re lured in by the rock-n-roll tunes, the bright pops of good ole Hawaiian shirt splendor, or the easy cool of the staff and regulars hanging outside, you’ll find yourself in a trippy little den of Americana and tropic nostalgia blues. With a mixture of original designs and pieces from a starry lineup of vintage revivalist brands from Japan and America, Junky Style is all set to deck you out à la James Dean on vacay. They’re hardly alone in embracing the vintage-esque trend, but this place packs a lot into a spot that feels homey and, dare I say, just about authentic. You’ll be the coolest kid in your 1970s class, and did I mention those Hawaiian shirts? Naka Building 1F, 4−37−6 Ryogoku, Sumida-ku. Nearest station: Ryogoku. Roots to Branches hits just about every mark of the ideal boutique. Craft, quality, and detail all reign here, as is made apparent the moment you open the door. 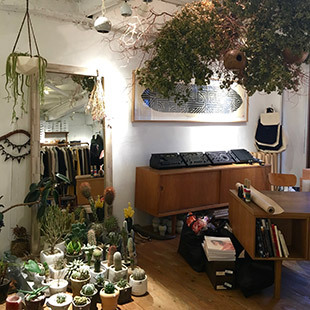 Situated in an unmarked, loft-like space on a Naka-meguro side street, the store is filled with light and plants, as well as unpretentiously stylish wares sourced from around the globe. Roots to Branches is not about showing off. Instead, it offers a range of lifestyle goods and clothing pieces to enrich the little things that make up our lives. This, to me, is a prime example of boutique-as-philosophy: less about fashion for commodity’s sake, but rather a peek into an elevated life, a room in which we might be reunited with our graceful, more inspired selves. The commitment to detail, personal attention, and embrace of comfortable elegance you find in places like Roots to Branches is what makes these independent shops stand above the mass fashion arenas. 1-16-7 Aobadai, Meguro-ku. Nearest station: Naka-meguro. 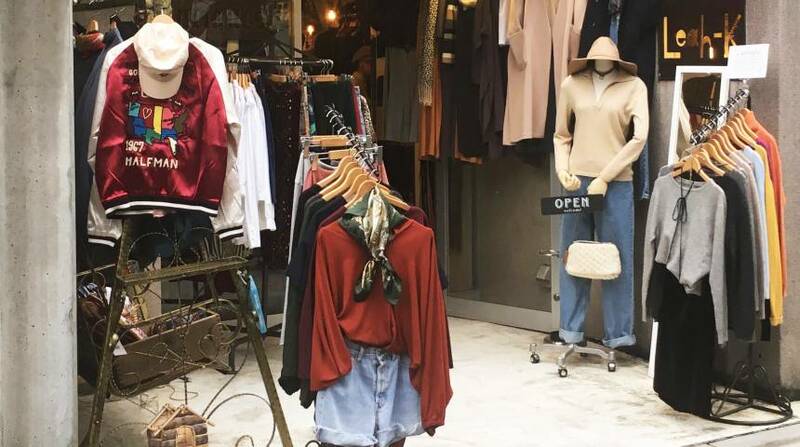 Tucked in among the tumbling, ever-vibrant array of vintage shops and hole-in-the-wall coffee joints of Shimokitazawa, Sansato is a cozy escape filled with art and a curated mix of clothes, gifts and lifestyle goods. Downstairs, the friendly staff presides over shelves and crannies of jewelry, dreamy stationery, and screen-printed wares often sourced from local and independent designers. Make your way up the narrow stairways lined with ceramics, cooly simple clothing, and a rotating painting selection to a space that feels like an artist’s wardrobe perched in a ship’s crowsnest. Try on the selection of small-label women’s staples and accessories, but take a minute to daydream and peek out over the busy street corner below. 5-36-14 Daizawa, Setagaya-ku. Nearest station: Shimokitazawa. While Tokyo does vintage quite well, this little cave on the south side of Naka-meguro’s tree-lined canal is particularly polished. Leah-K curates gently used pieces—think silk and velvet meets urban aesthete—as well as select everyday wear to match the new with the revisited. This gets us something like the ultimate wardrobe: equally unique, elegant and useful, and 100% enviable. Vintage scarves become vibrant new accessories in daughter company Rema-K’s eclectic re-workings, and the staff has an eye for timeless style as well as the unexpected. It’s no wonder the shop also moonlights as a stylist for Tokyo’s undercurrent of Bright Young Things, including a recent spread with style and DJ mag JAGR. 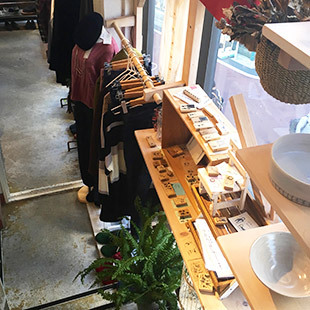 Strolling through Naka-meguro can be enough on its own to spruce up any rough spots in your day, but the vintage cashmere, indie grunge, and lacy touches at Leah-K shine things up real nice. 1−25 Aobadai, Meguro-ku. Nearest station: Naka-meguro. Sometimes Harajuku feels like it’s become such an established Tokyo shopping mecca that its original quirky charms have gotten squeezed in by bigger brands and prepackaged weird. But hope is not lost: the neighborhood continues to thrive and surprise off its more beaten tracks. SOL & BeBe SOL is one of those funky, well-executed, and totally delightful gems that doesn’t hold back on personality. This is a hidden Harajuku mainstay, a haven for exclusive, one-of-a-kind kawaii where the cute is charming and gnarly and the vintage pieces carefully selected for high fashion impact. Through collaborations with a diverse cast of cool young artists and designers, the stock here is always changing and always bent some degrees away from normal. You never know what to expect here, but you’re sure to come away dosed up with a true Harujuku DIY ethos. 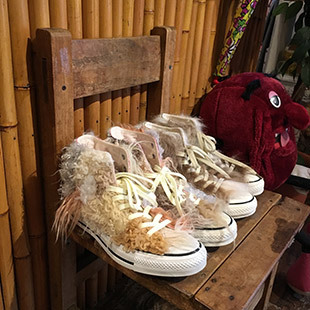 Come for the upcycled furry sneakers, stay for a brew at the rad little coffee bar that makes this place one of the ‘hood’s most winning hideaways. 3−20-3-1F, Jingumae, Shibuya-ku. Nearest station: Meijijingu-mae.